If you hadn't noticed I've started my new year in a healthy way, eating better and getting my bum off the couch. 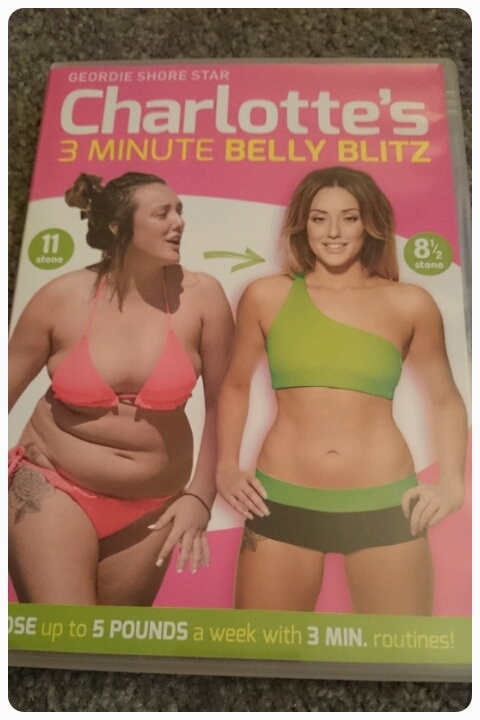 I've never been confident enough to go to the gym so I always opt for exercise DVDs, my collection is always growing and my latest purchase is Charlotte Crosby's 3 minute belly blitz. I have to say I was pleasantly surprised by this one. The DVD includes 12 rounds of workouts, each one lasting 3 minutes. There is also a 10 minute extra workout for your abs and an included diet plan to get you off on the right foot. Now 3 minutes might not sound a lot but I was left sweating after just the warm up. Each round has a beginner and a hard version and you even have the option of choosing which round you'd like to do so you can either do a couple, half or if feeling energised you can do the hole dvd. My favourite rounds are 5, 7 and 12!! Two weeks of doing it and I am definitely noticing a difference in my figure. Thanks to the lovely people at Cash Generator, I have a copy of this DVD to giveaway to one lucky reader, all you need to do is fill out the rafflecopter below. This giveaway is open to UK residents only and will be open til 11.59pm on the 24th February 2015. Make sure you fill in the form correctly as each entry will be checked and verified!! Regular exercise and cut down on the chocolate! For me, it's lots of water to drink and lots of walking. I need to tone up so badly, but don't seem to make time for anything other than walking these days. Need something like this to motivate me! As already been said above, everything in moderation. Also drink plenty of water and ensure you you exercise to raise your heart rate regularly. Eat a clean healthy diet and get some exercise. Eat well socially i.e. with company. I find eating outdoors in the good weather can be nice and relaxing. Drinking water, watching the calories and trying to do a bit of exercise every day. Hate to say it but drinking water and moving more (walknig more etc) has been a huge help. I eat natural foods and stay hydrated as well as working out. Walking your dogs (if you have them!) regularly is a great way of getting some extra exercise in! Everything in moderation! Be good 80% of the time and have what you want 20%. don't eat til you cant manage no more, just eat a small portion. Get enough sleep. Difficult with a toddler, but I do try. Sleeping at least 7 hours a night and drinking lots of water! Body building lenghtens life expectancy by ten years. Everything in moderation and LIVE every day. Drinking plenty of water and having your five a day. Try & eat your five portions of fruit & veg a day & drink lot's of water. Get a Rescue dog and will cove 5 mls each day easy. Drinking lots of water and eating breakfast. I live in the countryside so walking isn't a chore! A good brisk walk around the village does wonders! Drink lots of water, and walk rather than taking the car. Walk whenever you can, plenty of water and fill half your plate with veg to fill you up! pets are great at dealing with stress! Get a dog and take it for walks been told im loosing weight all over. If you don't want a pet then just go for a jog or bike ride. Make exercise fun otherwise you will loose interest fast! Going for walks with good friends, you're so busy chatting and catching up with the gossip that you don't realise how far you've walked. All things in moderation, and drink plenty of water. Lots of walking too. Get your nutrition right - eat clean, non-processed food most of the time and drink 2-3 litres of water per day. Cut down on caffeinated products, drink more water, wait until you're hungry until you eat and don't steal the kids' snacks/leftovers!